It is known that in 1798 LOL 553 was in existence but records from this period are not available. By 1801 the first records show that LOL 553 met in Dublin and the Worshipful Master was Bro Richard Wood. On 3 July 1829 the lodge warrant was re - issued to the village of Collon near Drogheda in County Louth. A duplicate warrant was issued on 28 November 1855 in Glenavy, County Antrim with. A further warrant bearing the number 553 was issued to Strabane but the details are not clear. The warrant was again re-issued on 15 April 1864 to a new lodge that was formed in Carrickfergus, the Worshipful Master being Bro John. Connolly. 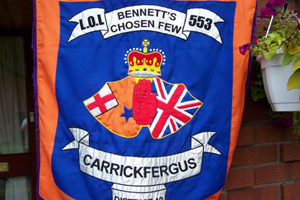 In 1864 when LOL 553 was formed in Carrickfergus it took the title of "Carrickfergus True Blues". This continued to be the Lodge name until 1897 when it was changed to "Bennetts Chosen Few" in honour of the Reverend J. H. Bennett, Worshipful District Master of Carrickfergus District Lodge and Worshipful Master of LOL 553. Through the years Bennetts Chosen Few LOL 553 has reflected the life of both the local community and the nation in general. This was evident in 1886 when a resolution was passed in the lodge which read "Viewing with alarm the state of the country and the likelihood of an attempt being made to Home Rule in Ireland we as a body of loyal men will resist to the utmost of our power any such demand as the repeal of the union of Great Britain and Ireland". At this time meetings were held on the first Saturday of each month in rooms rented in High Street Carrickfergus. At the October 1886 lodge meeting it was decided to change the meeting night to the first Tuesday in each month, the night with which we have all become familiar. The starting time of the meeting depended on the season. In summer the lodge met at 8.00pm but in winter, due to the shorter evenings the lodge met at 7.30pm. During the final decade of the last century the lodge was struggling to survive both financially and membership wise. Membership was so small that on 12 July 1890 only five members from Bennetts Chosen Few were on parade. The lodge realised that new members were required and numerous events were organised to interest people in the lodge. It is recorded that a "Soiree and Ball to commemorate the wicked design of the Gun Powder Plot" would be held on 5 November 1890. As lodge membership gradually increased and more money became available the lodges were able to engage Ballycarry Flute Band to accompany them on 12 July. It is also interesting to note that the Lodge Warrant was carried on parade and those members who were elected to carry the warrant and flags were paid for their labours and also received a free meal. As well as social evenings other methods of fund raising were employed. It is noteworthy that the services of the lodge goat could be hired for one shilling. In 1896 a levy of one shilling per month was imposed to obtain funding to purchase a new banner. 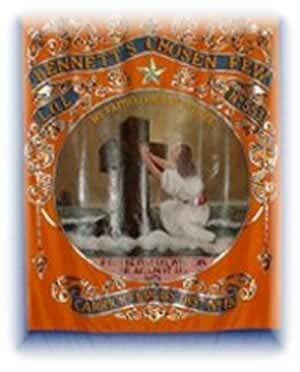 The banner was obtained in 1897 and was unfurled on 9 July 1897, the ceremony being performed by Mrs. Bennett. 1897 was also notable as it was in that year that the lodge name was changed from Carrickfergus True Blues to Bennetts Chosen Few. In November 1897 the lodge obtained a new warrant at a cost of half a crown. This is the warrant under which the lodge still meets today. In an effort to unify the lodge members' appearance whilst on parade it was decided that from 12 July 1899 all members would wear white gloves. 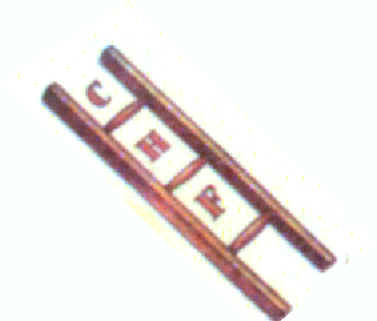 Lodge membership had grown to forty members by the year 1900. In June 1910 Bennetts Chosen Few agreed to send their condolences to Buckingham Palace on the death of the King. The letter read "We the members of Bennetts Chosen Few LOL 553 do hereby express our heartfelt sympathy with King George V and Queen Alexandria in their sad bereavement owing to the sudden death of our dearly loved sovereign King Edward VII". The lodge received a reply from The Home Office on behalf of Their Majesties. This letter was framed and was hung in the lodge room for many years. The lighter side of LOL 553 business was displayed in January 1913 when because of the latest advances in technology the lodge was able to stage an evening of "Cinematographic Entertainment". Later in 1913 a Royal Arch Purple Chapter warrant was issued to LOL 553. In January the following year it was decided that a collecting box would be placed on the Worshipful Masters table to enable members to make voluntary contributions to the Lord Enniskillen Memorial Orange Orphans Society. The year 1914 also saw the beginning of The First World War when many members of the lodge enlisted in the armed forces. During active service all those members who were serving King and Country were made exempt from paying dues and levies. In common with many other lodges and communities in Ulster LOL 553 suffered many casualties amongst its members. Thirteen members of LOL 553 paid the supreme sacrifice in The Great War. In February 1915 The Orange Institution suffered the death of it's Imperial Grand Master the Earl Of Erne and consequently LOL 553 entered into a period of mourning. However later in the same year the lodge was to suffer its own great loss with the sudden passing of Reverend J. Hamilton Bennett Worshipful District Master. At the time of Reverend Bennetts death the Worshipful Master of LOL 553 was Bro S. A. Woods. Bro Woods became the next Worshipful District Master of Carrickfergus. This was an honour bestowed upon LOL 553 and Bro Woods in recognition of Reverend Bennetts long service to Carrickfergus District Lodge. At the end of the First World War the membership of the lodge began to slowly increase and by 1923 had reached sixty five. The minute of March 1923 records an expression of sympathy being extended to Bro's Shaw and Owens, both of whom had lost relatives in the sinking of the SS Woodburn. 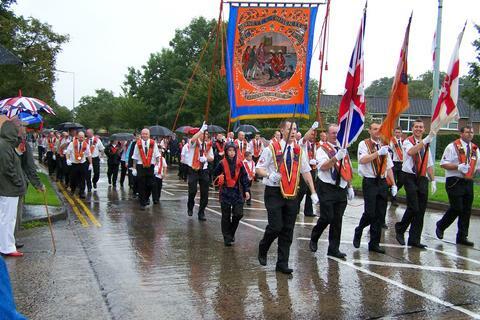 It was around this time that the lodge regalia changed from royal blue sashes to orange collarettes. The annual Installation Of Officers meetings in the 1920,s seem to have been memorable. In 1926 it was noted that the Worshipful Master, Bro Alex Close laid on a substantial tea for members and guests, a large supply of apples and oranges being made available. The tea was followed by an evening of entertainment and is described as a free and easy of ballads and songs. During the 1930's when the economy of the country declined and unemployment increased it was decided in April 1933 that those members who were unemployed would pay half dues which was then two old pence per month. Even though at this time it was difficult to make ends meet the lodge decided to purchase a new banner. Fund raising events were arranged and subscription were received from many members. Eventually sufficient funds were available and an order for the banner was placed with Bro Bridgett of Packenham Street Belfast. 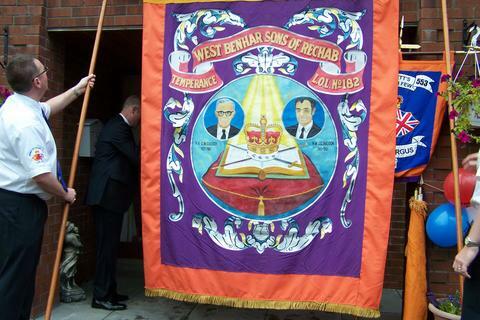 It was agreed that in keeping with the name of the lodge one side of the banner would be a portrait of the Reverend Bennett while the other side would depict an imaginative subject symbolic of the Protestant faith. The cost of the banner was twenty eight pounds and ten shillings. 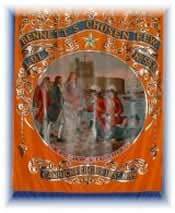 The banner was completed and unfurled at Carrickfergus Castle on Saturday 23 June 1934. LOL 553 has continued from strength to strength. Several Lodge members have served in conflicts such as World War II and in the security forces during the recent troubles in Northern Ireland. 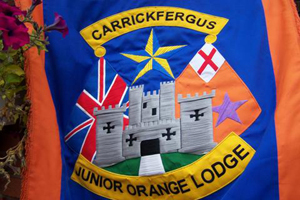 The Lodge has supplied many District Officers over the years and plays a full role in the life of Orangeism in Carrickfergus. It’s members have been there when needed and have been prominent in support of Portadown District No 1 who continue to take a stand for our Civil and Religious liberty. Joseph Hamilton Bennett was born in County Cork in 1844. He was the son of the Reverend Richard Parkes Bennett and was baptised in Saint Peters Church Cork on 1 January 1845. After being educated as a young man by Dr O'Brien he attended Trinity College Dublin where he graduated in 1867 with a Bachelor Of Arts degree. After further study he took Holy Orders and became curate in Glenavy where he served in this capacity from 1870 until 1876. In 1876 the Reverend J. H. Bennett became vicar of the united rural parishes of Kilroot, Islandmagee, and Templecorran. He remained as vicar in these parishes until his death in 1915. Reverend J. H. Bennett resided at Kilroot House with his wife Alice Rosamund and their large family and he received an annual stipend of £200. When the Reverend Bennett was curate at Glenavy he became a member of LOL 351 and after moving to Kilroot he remained a member of this lodge until 1881. 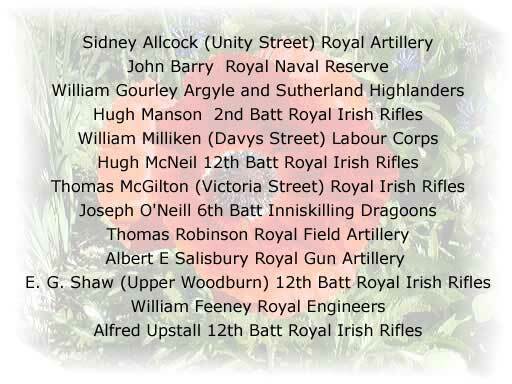 During 1882 and 1883 he was a member of Lisburn LOL 915. In 1884 Reverend Bennett transferred to Kilroot True Blues LOL 1544 and in 1887 he finally transferred to what was then Carrickfergus True Blues LOL 553. In 1888 Reverend J. Hamilton. Bennett became Worshipful Master of LOL 553 and in the same year was also elected Lodge Chaplain. He had been elected to the offices of Worshipful District Master and District Lecturer in 1884 and held both offices for thirty one years. He became a Deputy Grand Chaplain in County Antrim Grand Orange Lodge and was also a member of The Grand Orange Lodge Of Ireland. Bennets Chosen Few were immensely proud to be hosting West Benhar Sons of Rechab L.O.L. 182 from Harthill, Scotland who were celebrating their 100th. anniversary and who decided to mark their centenary by parading with L.O.L. 553 on 12th. July. Click photo for Ulster Grenadiers Flute Band (Carrickfergus), L.O.L.553 and 182 leaving the W.M. house on the morning of 12th. July.